(L-R) Syed Hussaini, Outreach Coordinator of the Council of American Islamic Relations (CAIR); Obaida Albaroudi President of Muslim Students Association (MSA) West, Nayereh Tohidi, director of the Middle Eastern and Islamic studies program; Phil Shigekuni President of the Japanese American Citizens League (JACL); Nisrin Elamin, graduate student at Stanford University, Khanum Shaikh, professor in gender and women's studies and Asian-American studies spoke to the local community about Trump's "Muslim Ban" at the Oviatt Library on Feb. 27. Photo by Cati Mayer. 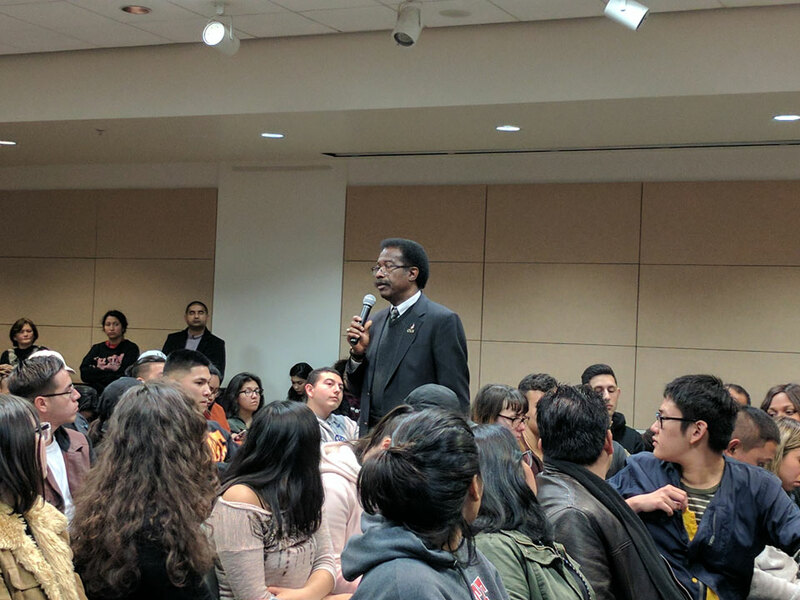 William Watkins, vice president of Student Affairs and dean of students spoke to CSUN students about the resources and support for affected students on campus. Photo by Cati Mayer. 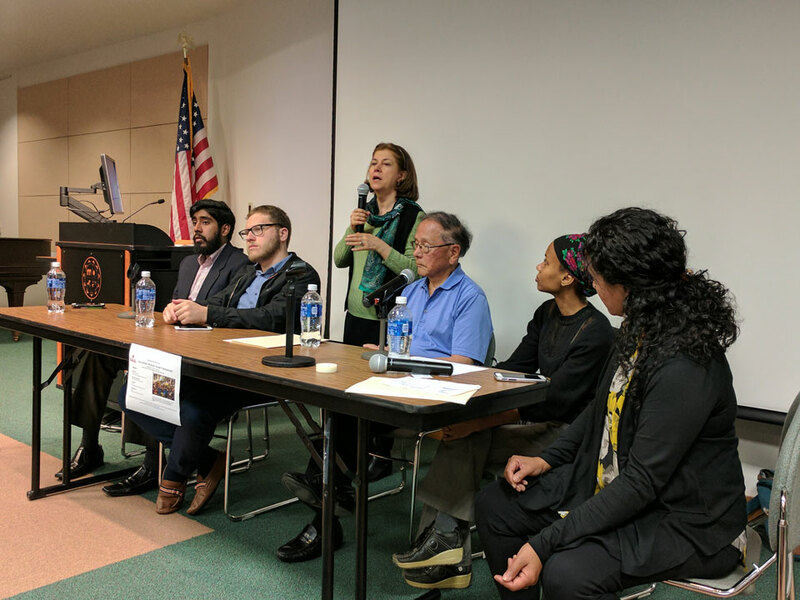 CSUN students, faculty and staff gathered in the Jack and Florence Ferman Presentation Room of the Oviatt Library on Feb.27 to discuss Trump's recent executive order, banning travelers from seven Muslim countries. Photo by Cati Mayer. Nisrin Elamin, a Stanford University graduate student, returned from her Ph.D. research in Sudan in late January and was handcuffed, detained and questioned upon her arrival at New York’s John F. Kennedy International Airport. Originally from Sudan, Elamin has lived in the United States for 24 years and became a permanent resident in 2012. After President Donald Trump last month signed Executive Order 13769 — banning citizens of seven Muslim countries from entering the U.S. — Elamin was one of more than 100 people detained at U.S. airports, unable to enter the country. 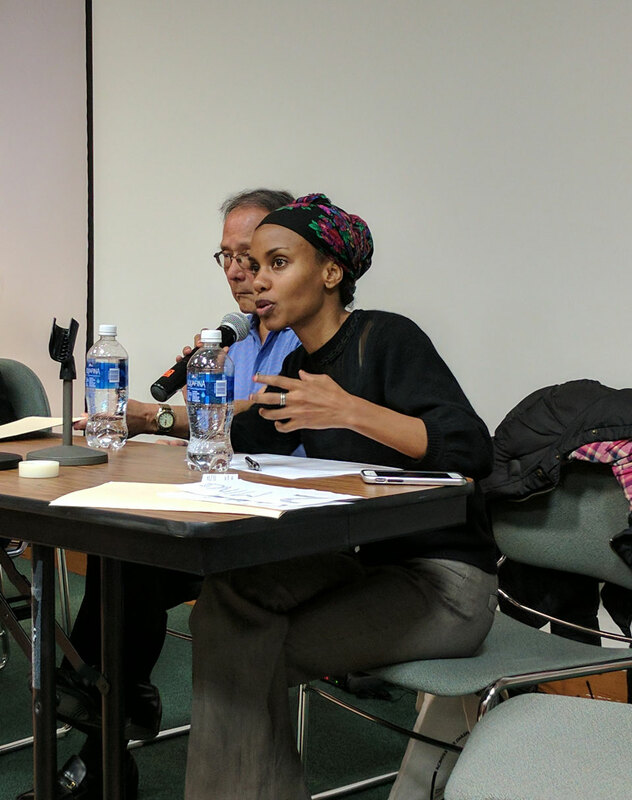 Elamin, who spoke about her experience on PBS Newshour participated in a panel at California State University, Northridge on Trump’s “Muslim Ban” on Feb. 27. 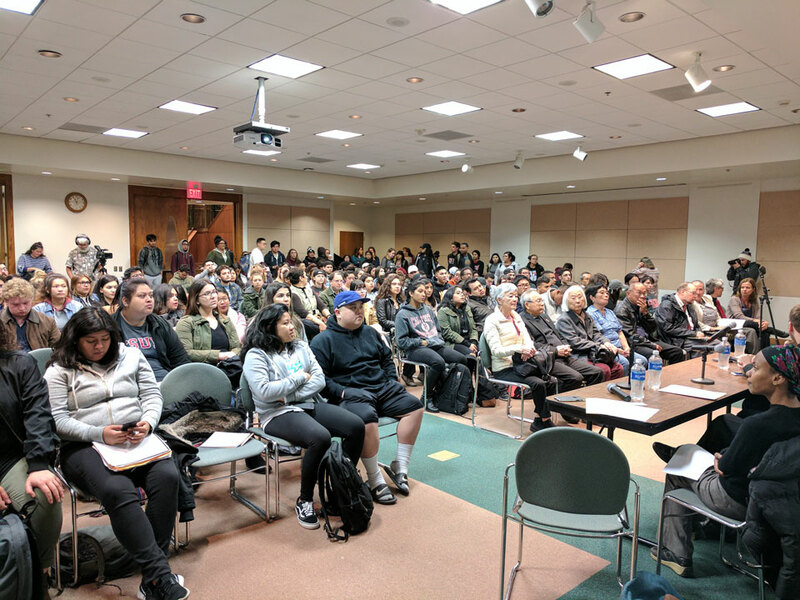 Held in the Jack and Florence Ferman Presentation Room, the program was open to CSUN students, faculty and staff, as well as the local community. The panelists discussed the order’s repercussions and addressed audience concerns, which were mainly expressed by students. Aside from Elamin, panel speakers included Syed Hussaini, outreach coordinator of the San Fernando Valley chapter of the Council of American Islamic Resources (CAIR); Phil Shigekuni, president of the Japanese American Citizens League (JACL) and Obaida Albaroudi, president of the Muslim Students Association (MSA) West. At CSUN, Albaroudi and Hussaini informed the audience of resources that support Muslims and shared stories about students they had assisted through CAIR and MSA. Shigekuni spoke about the history of Japanese-American persecution during World War II and emphasized Japanese-American solidarity with the Muslim community in fighting the travel ban.